In 2012, Doron Myersdorf, then a senior director of marketing and business development at tech giant, SanDisk decided to run a small experiment. Doron and his team wanted to see whether a recent study on the Alzheimer’s disease could be applied to increase efficiency in energy storage. The results were astounding. Inspired by this study, Doron and his team went on to build a groundbreaking battery charger which can charge any mobile phone battery within no more than 30 seconds. 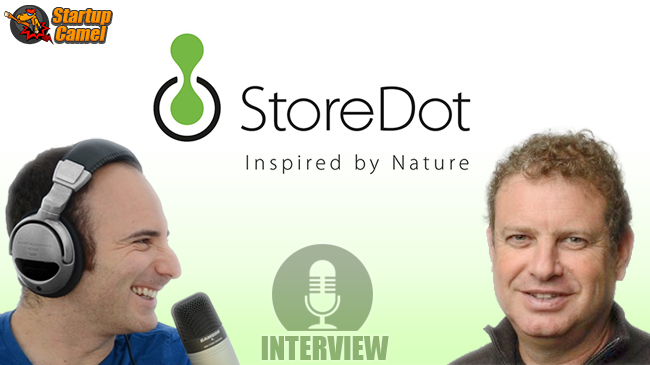 Today’s episode is about Doron’s revolutionary startup – StoreDot. I hope you enjoy this interview but more importantly, I hope it inspires you to start your own entrepreneur journey to change the world. Idan: You know, it took us quite some time to schedule this interview but it is finally happening and we are very excited to have you on the show. Doron: Thank you very much. I apologize; we were on trips and shows and we were all over. Idan: Just before we start I want to add a little more to the build up and tell our listeners that you are a very busy man just like you said right now and all for a good reason. Doron: The good reason is that in one minute we can charge your phone so every minute counts. Idan: So before we start I will tell you a little bit about how you going to do this interview. So the first part we will talk about your company StoreDot and your unique journey to entrepreneurship and the second part is going to be the camel ride race. I am going to ask you a few quick questions and you are going to give short but inspiring answers. Idan: Are you ready for this? Doron: Well, we already did change the world, by the way, it’s not something that is futuristic. We are demonstrating today 2 minutes charging of smart phones, for example, Galaxy S5. This is working; we just came back from a trip to the far east where we presented it to some of the leading players. As you know Samsung is an investor in StoreDot so obviously we visited there as well but we talked to many others. This thing works. This is not futuristic. Idan: This is amazing. This is amazing. So please tell us a little bit about this technology, what is it that you guys do? Doron: StoreDot is about compounds. Organic compounds, these are materials, new materials that are synthesized in our labs, so you can think about it a molecule level, we’re designing new molecules that are customised for a particular application. This is similar methodology to what you do in biotech. So think about like the Ebola virus, right? and you need to find the right vaccine to neutralize this virus so you are looking at the molecular structure on one hand, and then you are trying to see which would be the best match for it. So we’re doing the exact same thing only we don’t have a virus we have let’s say a battery or a memory or a display, you know StoreDot became famous because we are doing the flash charging but our first product was flash memory where we presented that we can write in flash 3 times faster than any other flash and we also did some image sensors and we did some displays. By the way, we are still doing today. We have a business unit that is doing new organic displays. So StoreDot is about new materials, new compounds that can really change many industries. We are starting with energy storage batteries and moving to displays and now we are also moving to electric vehicles as a new business unit that focuses on 5 minutes charging of an electric vehicle. Idan: And it’s also a lot greener right? It’s better for the environment because you reduce the amount of heavy metals, right? Doron: Yes, but I want to make it clear that we are not completely green. You know, we have a green manufacturing process that doesn’t harm the environment. We still use lithium in our batteries so we can’t ever say that we are green because lithium is not that great. You can’t dispose of it easily. But all are additives and all the processes which are around manufacturing are green. Doron: Yes, well, 30 seconds is what we originally presented but this battery was too big to fit inside the phone now we are presenting the battery in the phone factor of as I said, Galaxy S5, we do have similar energy density to the one in a normal battery but this one charges right now in 2 minutes. The one we will commercialize probably in mid 2016 will have one minute charging. So 30 seconds is still our goal but right now we don’t think we will commercialize in under 1 minute. Idan: Well, I don’t know if I have 2 minutes to wait (Ha ha ha) for a cell phone recharge. This all sounds very exciting. So what needs to happen in the next two years so that you can start using the new batteries and bring them to mass production? Doron: So it is a big gap between having a prototype in the lab and being in mass production. 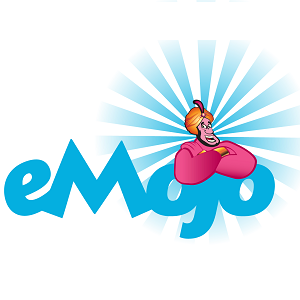 So we’re trying to bridge partnerships with major OEM’s in place, the smart phone makers. It requires a whole ecosystem change because the charger is different. There might be some modification to the connector, so the typical micro USB probably doesn’t cut it for the high currents. We are using up to 100 amps as compared to 1 or 2 today. So this is a whole different charger, different connector plus we need some modifications for the phone, the power management inside the phone needs to be modified in order to sustain these high currents. So we’re working on all these components including working with manufacturing sites mostly in China to see how we can ramp production to hundreds of thousands of units per day up to a million a day, because if it really catches up then you know a billion phones a year, you know, if we take a small portion of this market, we will still need a very large quantity of these batteries to be produced so we’re working on the supply chain that is required for mass production as well. Idan: Ok and you started mentioning how we can maybe use this product in the future. So what kind of applications could this kind of technology have in the future other than mobile phones, you mentioned electric cars, electric vehicle. Doron: Basically once we saw it working so we know that this can go to anything that is rechargeable. You think about, you know, toys, power tools, electric heaters, drones, everything basically and I am a hundred percent confident, forget StoreDot, even if StoreDot doesn’t exist, 5 years from now people will forget that they used to wait hours and hours for the battery to charge. This will be total history. I mean you will charge your car in minutes, you will charge your electric drill in seconds. The technology is already there. We see it. So even if we don’t do it and we don’t make it for some unknown reason, somebody else will do it. The materials and the technology is at a level that with some innovation you can get there, so this is only a matter of time and we are obviously trying to be the first in the race, to be the leaders in the fast charging market. We actually call it ‘instant charging’ because you charge on the go so basically you have an endless battery. There is zero downtime, you know, downtime for a mobile phone is when you are connected to the outlet because your mobile device isn’t mobile. So with the instant charging there is no downtime. You basically have an endless battery. It doesn’t matter if it’s 1000 milliamps per hour or 2000 or 3000 because if you are next to a charger, it instantly charges. So this is an endless battery. Idan: So this is so exciting I have to say, right now, I am reading a very interesting book, the biography of John Rockefeller. I think the interesting part for me is not the man himself, the interesting part is learning how people used to live before kerosene, you know before some people thought – “you know we can use this instead of white oil’. Doron: It is true. We see it. It is happening. It’s a matter of cost reduction, of mass production, bring this to market. Absolutely a hundred percent sure. Everything everywhere is charging fast in a few years. Doron: And we are here to help him actually. I want to demonstrate a Tesla that charges in 5 minutes. Idan: Oh, you went there? Idan: That’s amazing, that’s brilliant, you know. This sounds very very exciting. I want to know a little bit about you. Could you tell us about the things you did before starting StoreDot? Doron: So I completed my studies in the Technion and did my PhD in management engineering. This was way back in the early 90s. My undergraduate is also in information system and industrial engineering. I was a professor for a little while at the Technion and then I joined a consulting firm called Tefen that specialises in semiconductors. I went to the Silicon Valley and opened an office there. It became like a hundred engineers doing consulting for all fortune 500 companies. We did very very well but then I was there in the Silicon Valley during the bubble that was 1999-2000. Obviously, you cannot be there and not start a startup. So I had two start ups there in software. One of them is still alive. This is around enterprise productivity. Idan: What’s the name of the startup? Doron: Siftology. There was another one, Inner presence, it’s in security. By the way this is still something that I will do one day. What we did is, we managed the lifecycle of a document. So if I send you a CV and I want to control it throughout its life cycle,I have the power to make sure that you don’t forward it to anybody. I need to authorise for you to print it. I can monitor the number of printouts that you have and so forth and if I want to delete it even if it’s in your hands I can delete it. So we raised money for that, about 1 million and then Microsoft came with Office 2003, and in Office 2003 they said they will solve all the security issues. Obviously this never happened but it did scare all the investors in those days. But obviously this problem exists, if you think of all the problems we had with Snowden and the problems that we had in Israel with documents coming out of the military or any corporate dealing with this problem. This problem is still not solved because the e-mail is great. Connectivity is amazing but then the security goes away, and even I know in StoreDot that we have patents which I am really trying to protect and I want to make sure that no matter what happens nobody gets access to these documents, so I had to physically disconnect the server. The server, you cannot approach patents from the outside. It’s just disconnected. I am sure that one day they’ll be a solution to the security issues. And then I joined M-Systems and came back to Israel. This was after 10 years, I came back as VP of flash because of my semiconductor background. I basically managed all the procurement and technology of M-systems, we did the disc-on-key and all that. Idan: First mobile flash discs. Doron: Right, Exactly. And a year later there was the acquisition by SanDisk of M-Systems, and then I took a new business unit from scratch. We said the future of storage is SSD. Today it is one third of all SanDisk’s business but I started it from scratch. Basically what you do there is, you take a bunch of flash chips, you connect them with a controller and you connect them to the operating system and you have storage like you have the rotating disc but without any mechanical elements. Idan: So you have the hard drive..
Doron: Without the hard drive. Idan: Yes, Without the hard drive.. Ha ha ha..
Idan: Without it breaking or..
Doron: Nothing happens to it. We ran a jeep over it, we put it in a washing machine, hand dryer. SSD continues to work even after anything you do to it. So after it reached about a hundred million dollars of sales, this was like 3 years ago (today it’s about 1 billion) but those days they decided to move it to the US corporate and then I, together with a colleague at SanDisk, who was the Chief scientist at SanDisk facility and another Professor from Tel Aviv University, Professor Rosenman, we decided to start StoreDot around flash memory but it evolved from there to be more applications, more about the compounds and the applications we can take them to. Idan: At this point, there was a question I’ve been waiting to ask and that, this is something I read that you started this based on something you learned from an Alzheimer research. Is that right? Doron: Yes, it did give us ideas because originally we were dealing with peptides, yes. We thought that you can use those materials and manipulate them. So we said OK, Alzheimer’s is a memory problem so let’s do the memory out of it. So we were that crazy. But it did work for a limited performance but it did give us ideas that we can design new compounds that are not based on biological origin, but it does inspire us. So we say StoreDot is inspired by nature. So I can’t tell you that we are using any proteins or amino acids but it was some of the original thinking. Idan: Let’s talk a little bit about building a company because right now you are building a company. You have invested a lot of money. We have heard from entrepreneurs on the show that one of the most important things is choosing the right people to work with. How do you know who is right for StoreDot and who is not. Doron: I don’t have a good answer because myself still, I’m making mistakes and those that I am successful with, sometimes it’s pure chance. Idan: So you know what, let me ask you the same question from a different angle. Its not the same question. You have raised a lot of money for the company and you have been with a lot of companies which have raised a lot of money in the past, so how do you choose the right investors for your company who will provide the most value? Doron: Well, you know there’s the theory and there’s the practice. At the beginning when the company is bootstrapping, you can’t be too choosy or selective. You meet a dozen, two dozen people, you see who is interested and you’re trying to raise your first, I would say 3-5 million from whomever. Sometimes you make mistakes and I have made mistakes in the past also. You need at least one that is value add, at least one. Because to say that you need investors that is smart money and they can open doors for you, everybody will say that. Well, that’s easier said than done. I think you should have at least one that can leverage his experience; his connections whatever and the rest just bring money. You need money to get out of the incubation, to break this limit. So to answer your question, any money is good, of course with the understanding that you don’t give too much power that doesn’t let you run the company. So things like veto rights on budget for example, veto rights on raising more money, veto rights on the strategic direction of the company. If you give this to investors, if they ask for it, don’t take their money. On the other hand, if they are there to support you, even if the money came from, I don’t know, coal mining, this is still good money. So I think at the end of the day you need to assemble a team that enables you to run your plan but doesn’t stop you from raising money. Idan: So you mentioned giving investors the ability to veto your decisions, however, it’s very difficult to say no to that money in the beginning. Doron: You need to take money and start your work because you know, let’s say it’s a magic time, let’s say a year. If you are looking for a year for money and you delay the decision because of the structure of the investor community that you have around you, then probably you just kill the whole thing or just take the money. If you continue the second year with the same pattern, let’s talk to more investors, maybe take a 100,000 here, a 100,000 there and wait for better investors, this is not good. First of all there is competition that will hear what you are doing and will do it, and secondly your team is losing steam. So I would say give yourself a timeline, roughly a year to find the best investors and then take what you can and start the company. Idan: you mentioned the team and losing steam as you said right now. So how do you prevent that from happening? How do you create that company culture that really pushes the team forward? Doron: I think it is milestones of success. You have to set a milestone that is on one hand very ambitious but that you know is achievable and in a reasonable timeline, let’s say next quarter. So the first milestone is, let’s say, we want to show an electrode which is a hundred times better than the existing electrodes. This was our first goal. It sounded crazy but we knew from theory that it can be done. Because we have seen papers which show that you can do ten times better. If somebody can do ten times better, we can do a hundred times better. So this was our goal. We reached our goal and this gave us a very good boost. The next goal was, we want to charge a smart phone in 30 seconds. Doesn’t matter how big the battery is, doesn’t matter how much energy is used. Let’s charge it in 30 seconds. So we did that. It was very bulky and ugly but we did it. It was what we presented at the Microsoft Think Next last year. Our next milestone was, no matter what, we need to be inside the phone and we reached that a few months ago. Our next one is the five minute electric vehicle charging. This sounds crazy today but I’m a 100% sure we’ll do that as well. So to summarize, achievable milestones but ambitious. If it’s a success story, everyone is around you for the next one. Idan: I have a question to investors that come here that the crowd wanted to ask. We read that you got Roman Abarmovich to invest in your company. So how did you do that? Doron: Well, basically he came to us. He saw this clip that we put online. It had 3 million hits in the first 24 hours. It’s of the 30 second charging. And he came and he said, you know, this opportunity seems big enough. You guys seem serious enough, you know, let’s do it. So this was a very fast investment for us. Idan: Wow! This is very interesting. You know, it’s very important. I wanted to hear the answer to this question because it’s important to understand that investors are just like anybody else. The way they think is like, you know, the team is serious enough, like you said and there’s a good opportunity. Doron: Well, good is not good enough. The opportunities that these guys are looking for is 100X. This is not, you know, making 2X on their money is not interesting. He’s making that anyhow. Making a 100X or changing the world or going off to a market that is a game changer for something like a smart phone or like an electric vehicle that everybody uses and everybody feels the pain. That’s what they are looking for. Idan: I want to talk to you, really quickly about challenge. So could you share with us a time where you had a major challenge for the business and how you overcame it. Doron: So we just came back from a trip in Korea and the goal in this trip was to overcome the scepticism that we had in some of the large companies about the capabilities of our battery because they all want us to send samples, and my answer is always no. They will try to copy our battery. Even if they are Americans and not Chinese, they will try to copy. With Chinese you know what you’re dealing with. With Americans, with Koreans you don’t know. I mean, they don’t hide it. They ask questions that we know they don’t need to know at this time but they still ask them. So the challenge was how we are going to prove to them that this is the real deal? Idan: Ok. So how did you do that? Doron: Ok. So what we are doing, and this is really an out of the box thinking, is we told them in advance that if anybody in the crowd, and this is all VP’s. I’m talking 30 VP’s in the room, if anybody has an S5, Galaxy S5, we’ll charge his phone. Not our phone. And this did it. And we charged his phone in one minute. And they were ready. They came with 5 phones and they started moving the battery from one phone to the other. Each one ran different software to analyze what is happening. Voltage, current, you know, peaks. Everything that you can dig out of the battery without actually deconstructing it. Doron: So this was a major challenge and after we came back I think I can tell you that this thing is amazing. We did what we had to do. People stayed here ‘till like 3-4 a.m. in the last month, before the trip to make this happen. When we tailor it to our phone, you know, we can play with the software, do things, even glue the battery in some places, weld it and all that sort of things. This was I would say a major challenge that the team here definitely proved that they can do the impossible. Idan: That is amazing. It is so exciting to know about a team that is so dedicated to doing something like that and really changing the world. Do you ever fear that you may not be able to deliver eventually? Doron: There is some fear, not that we will not be able to deliver but that we won’t be the first. That’s what worries me because, you know, it’s a small start up and we are actually competing with the giants. What actually happened after we showed this clip a year ago, departments were opened, you know, they actually call it the StoreDot project. Inside any big company there is a StoreDot project trying to replicate what we are doing. They think, if they can do it, they are only 30 people, even if they are 20 PhD’s but you know, for example, take Samsung for example, they have 20,000 PhD’s. So they are assembling a right team and back to the team, we have biologists, biochemists, electrical engineers, electrochemists, quantum physicists, they are all PhDs. And this assembly of different disciplines to design a new molecule, a new compound, a new material is really unique. Idan: One last question, are you hiring right now, because it sounds like a very exciting environment to work in. Doron: We are hiring big time because we are raising more funds for the electric vehicle. So we are hiring I would say, roughly 50 people. Idan: What are you looking for? Doron: We are looking for people who understand batteries, people who understand vehicles, people who understand out of the box thinking, very talented people, we need to work hard. Yeah, this is it. Idan: Excellent, Ok. It’s time for the second part of the interview, the Camel Race. Idan: Excellent. I’m going to ask you a few quick questions and you are going to provide answers. The first question, please give us a glimpse into your toolbox. One tool you use at work that you think our listeners should know about. Doron: Well, I’m thinking a lot about the chess game. Doron: Yes, because there are a lot of things happening concurrently and real time and you need to make your move with investors, employees or with your customers and you always need to think a few steps ahead trying to understand what will happen, how will this shape up and take the best move you can with what you see on the board. Idan: What’s the best tip that you received before a presentation or a meeting with the investors? Doron: Well, everybody knows the answer about the underwear but… you know this one? Imagine yourself in underwear and imagine the other people also in underwear and you will not feel awkward anymore. But I didn’t connect to this one too much even though I tried it in the past. I think about yoga. I used to do a lot of yoga in the past. One thing is waiting. It is also a lot of self control. It’s also dedication, you know, you stay in your position, you hold on to your position and know what you are doing. In general I would say, giving yourself the right framework, in grounding yourself to where you are and what’s the message you’re trying to deliver. Idan: Are you a reader and if so what is your favourite book? Doron: I’m not a big reader. I would say my favourite book is the Startup Nation. Doron: StartUp Nation is my favourite book because it summarizes exactly what we do. Idan: StartUp Nation by Saul Singer, and we had Saul on the show . What is the one personality trait that you think every entrepreneur has to have? Doron: Guts. You have to have guts because there is always the fear of failure, but you have to avoid or very quickly overcome it. Idan: What would be your advice to aspiring entrepreneurs or people who want to join the startup scene? Doron: Go change the world. Idan: Excellent. Which company from the Israeli startup scene would you recommend us to pay special attention to? Idan: Outbrain. We had Ori Lahav from Outbrain on the show. Very interesting episode. And the last question for the day, what are you doing tonight after switching off? Doron: Tonight after switching of, Yoga. Idan: Yoga. Excellent, so you are still doing Yoga. Idan: Which kind of Yoga? Doron: This is the Hatha Yoga, the classical one, the routine, the breathing, everything. Idan: Ok so Doron, I would like to thank you so much for joining us today. It was a very interesting, very inspiring episode and I think your technology will actually change the world. I am anxiously waiting to see what it will bring. Doron: It will come soon. Idan: Yes, I’m sure it will, and for any of you who want to know more about Dawn and about StoreDot, check out our website at startupcamel.com and you can also find us on Facebook and on Twitter. Please join us next week for another episode full of inspiration and motivation directly from the heart of Israeli startup scene. Till then I’m Idan Hershko signing off. Goodbye. Combining academic excellence with entrepreneurial spirit, Dr. Doron Myersdorf has gone from a PHD and lecturing at Israel’s prestigious Technion institute to headlining Silicon Valley companies and back to the startup nation. After finding the time to balance between founding two startups and being Sandisk’s head of marketing and business development (and boosting the company’s SSD sales from 0 to 100 million in just three years), Myersdorf decided to combine all his previous knowledge in his third startup: StoreDot. The future is already here, and it’s brought to you by StoreDot. By using innovative organic compounds created specifically for this purpose, the startup has managed to create a new generation of batteries and a new definition for fast charging times, that range between 30 seconds to 2 minutes. While StoreDot’s current major focus is super-fast charged smartphone batteries (the startup is backed by non other than Samsung), they also offer similar technologies for electrical vehicles and LED displays. Don’t be surprised if you find StoreDot’s tech inside your phone, car and other electrical appliances in the coming years. Join our mission to spread the word about Israeli innovation!